Atlas Brewing Company is one of Chicago’s newest craft beer destinations. Resurrecting the name of one of Chicago’s oldest breweries which closed after prohibition, the NEW Atlas is a small brewpub serving a variety of handcrafted beer paired with a creative food menu. 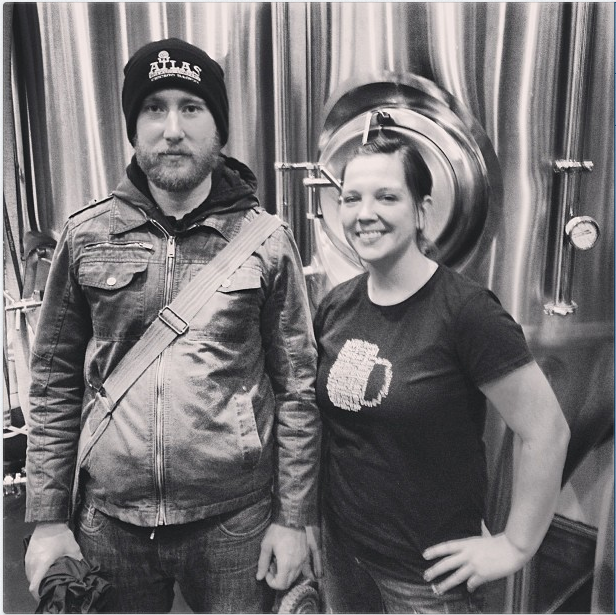 I had the pleasure of meeting brothers and brewers Ben and John Saller when the brewpub first launched last spring. Adjoining Seven Ten Lounge, its a really fun spot for bowling and craft beer! After months of beer talk and homebrewing tips, Ben kindly allowed me the opportunity to come in and assist on a brew day, to experience craft brewing on a scale much larger than my apartment kitchen setup. Atlas brews on a 7 barrel system and is currently producing 1-2 batches a week. The Atlas brewpub has anywhere from 8-10 of their own beers on tap at any given time, which is impressive! The recipe we were brewing that day was a Russian Imperial Stout. This style is a high gravity, dark, full-bodied stout with a very complex roasted malt flavor. The ABV can range anywhere from 8-12%. We were shooting for 10% with an OG (Original Gravity) of 1.100. 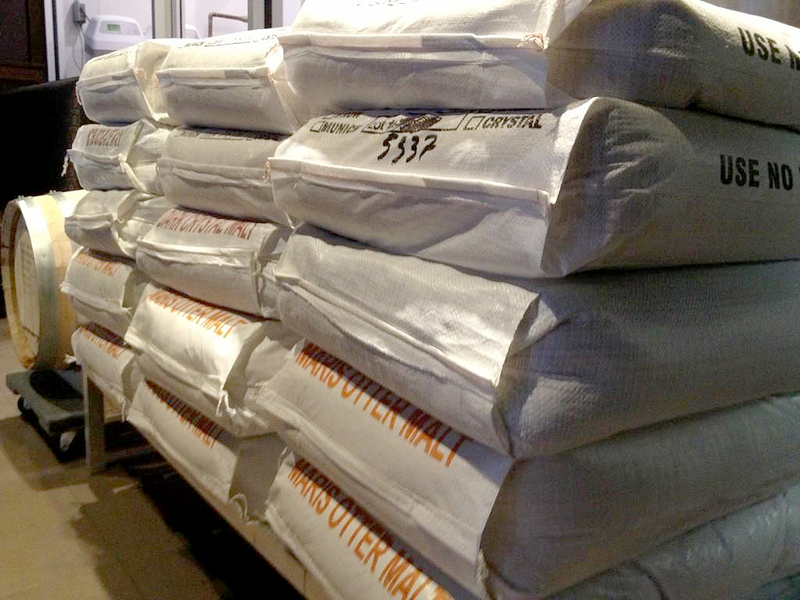 Ben’s recipe called for 770 pounds of grain. I realized quickly after sizing up the grain bags, that getting the grain into the Mash Tun was going to be the first challenge of the day! Although the process was roughly the same as homebrewing, witnessing it at this scale was overwhelming to say the least. He walked me through each step of the process even allowing me to do some of the more glamorous tasks like hopping the beer, measuring the gravity and last but not least using the power hose! While we had some downtime I was able to pick Ben’s brain on a few questions I had. 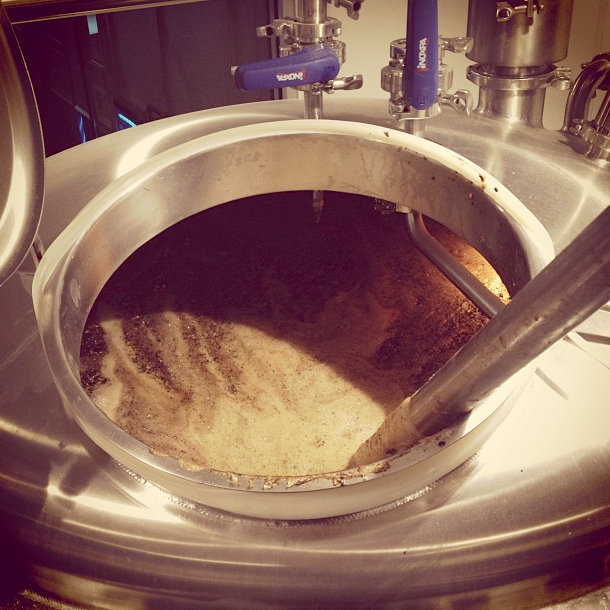 What inspired you to take the leap from homebrewing to owning a brewpub? I wasn’t really finding many other things that I enjoyed doing for a living. I love cooking and sharing food and beer with people. When I started homebrewing I found that friends enjoyed partaking, so doing that as a profession definitely appealed to me. Some people say you shouldn’t try to turn your hobby into a job because it will ruin the fun but so far that hasn’t been the case. What has your experience of the Chicago craft beer community been like over the last year? Its been pretty amazing to see that people whose businesses compete with each other are basically like family in a lot of cases. We’ve received a huge amount of support from a wide range of people and nobody ever seems hesitant to withhold advice or encouragement from us. Its been great. We try to help out other breweries like they’ve helped us, but featuring their products here and giving them assistance in any way we can. Hopefully as the craft beer industry grows that sense of family doesn’t go away. How would you define your brewing style? Do you find that you gravitate towards certain types of recipes? We don’t tend to do really outlandish stuff here, but we also don’t necessarily stick rigidly to known styles. I think an example of something unique was our Monadnock Rye Ale. It was a pretty smooth brown ale with English and Noble hop character, brewed with a decent amount of rye to give it a little complexity and spice. That was a beer different from any I’d had before - it was something that we came up with and were very happy with. The barrel-aged Monadnock Rye won a medal at FoBAB (Festival of Barrel Aged Beer) which was pretty cool. The Quadrupal with oak and cognac was another recipe we thought would taste good. We’re going to start doing some things we haven’t tried yet like an occasional cask ale, brewing with wild yeast as well as with fruit when it comes back in season. There’s so much that can be done with just those four ingredients (water, malt, hops, and yeast) that I think that John and I are fascinated at the possibilities. Thanks again for the learning opportunity Atlas. It was a great day!